The four-story Weston Building stood on the west side of Canal St., just north of Sweet's Hotel, which is at the far left of the photo. 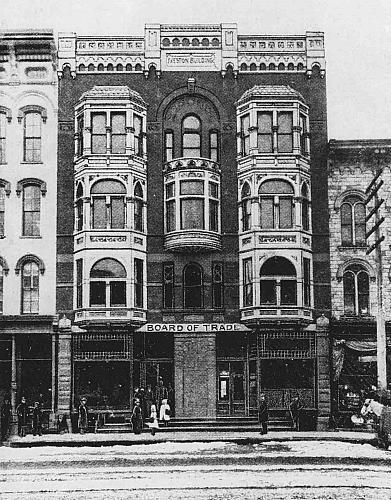 A sign indicates that the Board of Trade, later the Chamber of Commerce, is housed in the building. In late November of 1908, a new organization, The Guild, a group of six Grand Rapids furniture companies, signed a five-year lease for quarters to accommodate their club rooms on the second floor of the Weston Building. The Weston was razed in 1913 for the expansion of the Pantlind Hotel, the former Sweet's Hotel. Coll. 33-1017, History & Special Collections Dept.